The Carolina Panthers defeated the Dallas Cowboys on Sunday afternoon, 16-8, during the NFL’s first full Sunday of action. The Cowboys were unable to get much going for three quarters on offense as only Cole Beasley hauled in over 30 yards and the Cowboys had to fight for every yard. Seemingly no receiver looked capable of making a play downfield. The Cowboys offensive line without Travis Fredrick struggled to be its dominant self and the problems at right tackle and left guard were still an issue as Connor Williams was clearly outmatched in his debut game at guard. The Cowboys defense played well enough to win led by edge defender Demarcus Lawrence as he racked up several pressures and got home on a sack off of a stunt. He was a force in run defense as well, picking up right where he left off a season ago where he graded as one of the best edge-rushers in the NFL. The coverage unit for the Cowboys was a mixed bag as Byron Jones and Anthony Brown played well, locking down wide receivers for the Panthers, but keeping Christian McCaffrey in check was troublesome for the linebackers as they gave up a few big plays to the second-year back. Quarterback Cam Newton spread the wealth and though he was held out of the end zone via the air, was able to walk in on a zone-read play when the Cowboys defense seemingly forgot about the running ability of the former MVP. Cam did well to protect the ball despite his offensive line struggling to keep Dallas’ pass-rushers in check. The committee of Christian McCaffrey and CJ Anderson, combined with Newton’s legs, kept the chains moving. McCaffrey excelled in the receiving game, frequently making defenders miss in space and outside of his one fumble, made the most of the blocks his offensive linemen gave him. Anderson frequently found the open lane and set up the final touchdown with a run down to the one. Luke Kuechly went down with an injury late in the game, which took away from his elite performance as prior to the injury, he was all over the field making stops in both the run and pass game. 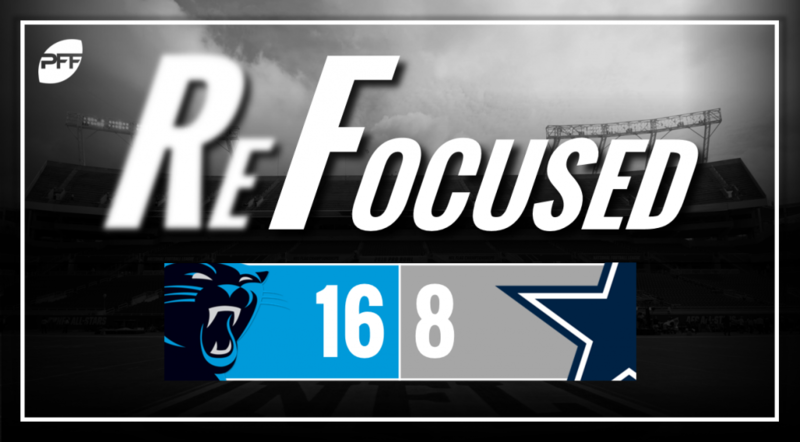 The Panthers managed to get a decent push in the run game and late in the game were able to take advantage of the Cowboys’ weakness on the offensive line, however, there still looks to be issues with the pass-rush for the Panthers as they couldn’t get consistent pressure on the quarterback. Carolina: The Panthers were able to control the game by protecting the football (outside of the early fumble by McCaffrey) and using a nice balance of runs and passes. Newton didn’t put the ball in harm’s way and his play allowed them to eek out a win. Dallas: The Dallas offense needs to improve as they struggled to find their rhythm all game long as they where clearly outmatched and had nothing downfield to get any chunk plays.